Three YPG/PKK terrorists surrendered to Turkish security forces in southeastern Sirnak province on Saturday, according to a security source. 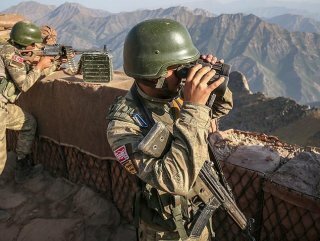 As a result of family-backed persuasion efforts of an intelligence unit of Provincial Gendarmerie Command, the terrorists surrendered to a police station at Habur border gate in Silopi district, said the source, who asked not to be named due to restrictions on speaking to the media. The terrorists are learned to had joined the organization in 2013, and that one of them was so-called “team representative”. In its more than 30-year terror campaign against Turkey, the PKK -- listed as a terrorist organization by Turkey, the U.S. and the EU -- has been responsible for the death of some 40,000 people.